Brazilians elected Jair Bolsonaro, “the Trump of Brazil,” as their next president on Sunday. The far-rightist Jair Bolsonaro won Sunday’s presidential election with 55 percent of the vote. 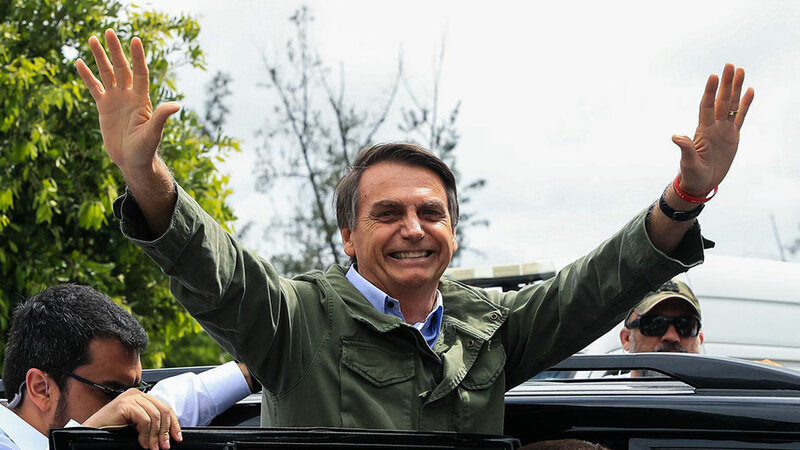 The victory by a man called by some “the Trump of Brazil” promises to push Latin America’s largest democracy to the right in many arenas, including drug policy, where his past pronouncements place him firmly in the camp of murderous anti-drug reform authoritarians such as Philippines President Rodrigo Duterte, who has presided over a war on drug sellers and users that has left more than 20,000 dead at the hands of police and shadowy vigilante death squads. Despite a highly divisive candidacy that included repeated derogatory comments aimed at gays, women, black people, and indigenous peoples, his victory over the Workers’ Party, which has been tarnished by corruption scandals, was decisive. Bolsonaro will act as if he has a mandate from the voters to enact his extremist policies, among them extraordinarily repressive drug policies. Thanks to London-based Talking Drugs, we have a very clear idea of just how extreme Bolsonaro will be on drug policy. Saying the bloody-handed Duterte “did the right thing for his country,” Bolsonaro seeks to emulate him, saying repeatedly that police should kill people suspected—not convicted—of drug trafficking. He has also vowed to intensify an already militarized crackdown on drug offenses, deepening the human rights and public health crises that drug prohibition has already inflicted on the country. Police and the military already work together to raid, arrest, and, too often, kill people allegedly involved in drug trafficking, especially in the favelas, the urban slums home to millions of the country’s poor. Brazil’s murder rate is 27 per 100,000 people, four times the global average and higher than the rates of neighbors such as Bolivia, Colombia, and Peru—all cocaine-producing countries. Brazil is the world’s second-largest cocaine-consuming country, after the United States. Domestic drug consumption has been on the rise for years in Brazil, and although there have been legislative attempts to decriminalize drug use, drug users continue to be criminalized, contributing mightily to Brazil’s ranking as the country with the world’s fourth-largest prison population. Speaking of maconha (Brazilian slang for marijuana), Bolsonaro isn’t too fond of that, either. In fact, he sounds positively deranged on the issue. Legalizing marijuana, as neighboring Uruguay has done, would “benefit traffickers, rapists, and hostage takers,” he charged, without bothering to cite any supporting evidence of his claims and in direct contradiction of the Uruguayan experience. And in a bizarre interview with El Pais, the homophobic Bolsonaro even claimed that using drugs makes people gay. When the journalist who interviewed him published the piece, Bolsonaro accused him of being gay, too. He demonstrates a very Trumpian tendency to play fast and loose with the facts to try to score ideological points. He has linked illegal drug use to liberal governments, claiming that “drug use is prominent in countries under liberal administrations, such as Honduras, Nicaragua, El Salvador, Mexico, and Venezuela.” But Honduras has been ruled by rightists since 2010, and Mexico’s current president is a member of the center-right Institutional Revolutionary Party. All of this doesn’t bode well for progress on progressive drug policies in Brazil. In the past, there have been strong, public health-based initiatives to provide harm reduction services to drug users, including a very successful program created by then Sao Paolo Mayor Fernando Haddad. His With Open Arms program provided drug users with housing, daily meals, access to health care, and the opportunity to earn money by doing cleaning work. The program was a success in reducing drug-related harms, but has been dramatically slashed by his successor. Haddad was the last candidate standing between Bolsonaro and the presidency, but the country’s swing to the right overwhelmed him. While the immediate future for progressive drug reform in Brazil looks grim, the one bright spot is that, like Trump, Bolsonaro tends to make bold, yet vague, pronouncements, often with little follow-through. Let’s hope his tough talk on drugs is more bluster than actual concrete policy shifts to the right, but hope isn’t going to win the day. Brazilians concerned about human rights, public safety, harm reduction, and drug law reform are going to have to mobilize to protect what limited gains they have won and to prevent sliding backward by embracing harsh, failed, last-century drug policies.